Let’s face it! Glass doors in your shower can give your bathroom a sleek, modern look, but may be hard to keep clean. Constant showering will cause soap scum build-up. Hard water stains, mildew, mineral deposits and dead skin cells will cause your doors to appear cloudy. With a tight schedule, keeping shower doors clean can be a chore. In a few easy steps, we can show you how to cope. 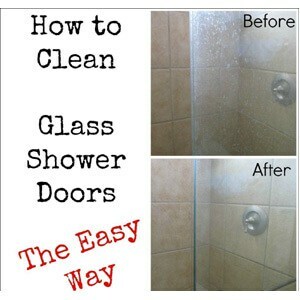 To help minimize build-up on your shower doors. Schedule a cleaning program that can keep them looking great every time you step into the bathroom. There’s an array of cleaning products available to help keep your shower doors clean. Your choice will depend on your preferences.Exposure to some chemicals may cause allergic reactions to yourself our others. You may opt for other natural methods which we will explore as we go along. Make it a habit of giving the doors a once-over after you shower. While it may seem unrealistic for some, it only takes a few extra minutes. Daily wipe downs will help lessen build-ups and reduce harsh, weekly or monthly cleaning. After you shower, take a cloth or towel and wipe the doors dry. It will reduce water stains on shower doors. Use the heat and steam immediately after showering to help break down soap scum as you scour the surface. Leave the shower doors open to allow the water and mist to evaporate. Soap scum build-up is one of the significant causes of cloudy shower doors. If left unchecked, it can be hard to remove. Some natural soaps may contain ingredients like paraffin and talc. They can contribute to the problem. Some shampoos and body washes may contain oils that can cloud up shower doors. Opt for more natural products, which work better with hard water. Use soft materials like microfiber cloths or sponges to minimize scratching between cleaning. After you wipe the doors down, finish it with a splash of spray cleaner of your choice. Clean your rags after each use to avoid dirt and mold build-up. You can launder them in the washing machine as well. One of the areas of concern in the shower is the unsightly trail of soap and mildew stains around the door tracks. Some studies suggest filling in any spaces in the door track. One study recommends using vinegar. Apply the vinegar for as long as possible, even overnight if necessary. Wipe it clean, and watch it sparkle. In spite of good intentions, we may miss the daily routine because of other priorities. Don’t despair; you can still make up for lost time. Your monthly clean may be a bit more intensive, mainly if the daily regimen falls by the wayside. It means you may have more grime and soap scum to clean up. You can do the job yourself if you have the time. Schedule a professional cleaner for excess build-up. Gloves will keep your hands and skin away from chemical spills. Choose the best materials and products to help remove harsh stains and soap scum. While most chemicals will help remove the gunk from your shower door, some toxic substances may affect your lungs or cause allergic sensitvity. Squeegees work similar to the windshield wipers on your vehicle. The rubber blade helps erase water stains from glass surfaces. They may be available in stainless steel and can store easily by attaching the suction cup to the bathroom wall. Some studies recommend the micro-fiber cloths to get at tight areas like around edges and under the door handles. They are super absorbent and non-scratching.The fibers reduce build-up and streaking and are ideal for drying and polishing. Magic eraser sponges are affordable, lightweight and non-abrasive. They get between hard-to-reach areas and grooves, to remove dirt and grime between crevices and cracks. The scouring action helps remove mold, soap scum, stains, and mildew. They also reduce fogging on shower doors. Dampen the sponge lightly with water. Use gentle strokes and work the area until it is clean. Wipe the surface with a wet cloth to remove any remaining residue. Oh yes! Believe it or not, dryer sheets can help remove stubborn soap scum build up on your shower doors. Hard water stains and calcium deposits make the glass cloudy and dingy. They will clean, minimize streaks and help restore shine. Slightly dampen the dryer sheets and watch your shower doors come alive with sheen and fewer streaks. They will have your shower smelling fresh as well. While Barkeepers Friend is a multi-purse kitchen cleaner, it can be used in the shower as well. It’s a gentle cleaning powder that can make quick work in reducing soap scum build-up and promoting shine. Put the powder directly onto the glass or add it to a damp sponge or cloth and scrub the doors. Wear your gloves toprotect your skin. Get rid of soap scum, mold, stains, and mildew from shower doors with Krud Kutter. KrudKutter is a concentrated cleaner. It’s a streak-free option to keep your shower doors looking like new. It’s also ammonia-free and will not damage the glass doors. Spray it on or use it with a damp cloth. Wipe the doors until the build-up dissolves. Shine with a clean cloth. Tilex is a householdname in cleaning products. The shower cleaner is said to be mild and will help lift soap scum, mildew, and stains from shower doors. The ingredients in Tilex act as a solvent to loosen stins and mineral deposits. According to instructions, spray on Tilex to shower doors and leave it to do its work. You can leave it on, no need to wipe away. It’s ideal for daily use to help reduce build-up. Non-toxic, biodegradable products help clean without the risks of exposure to harsh chemicals. It is long used as a household cleaner. The acetic acid acts as a solvent and helps break up mineral deposits. It’s a good product for cleaning glass and unclogging drains. Vinegar is relatively cheap when compared to commercial products. Vinegar works well on the glassbecause it does not streak, so yourdoors stay bright and clean. Studies recommend you dilute the vinegar with water to minimize damage from the acid. Mix equal parts vinegar and water. You can use the spray-on method from a bottle or wipe with a cloth. Dampen a clean cloth and wipe the surfaces. For hard to move build-up, use the undiluted vinegar. Baking Soda is another cheap but non-toxic option to clean shower doors. It is non-abrasive and gentle on surfaces. It neutralizes stains and odors and freshens surfaces. Sprinkle baking soda on the surface, onto a damp cloth or make a paste with water. Work the area until stains are gone. Wipe clean with a fresh towel or sponge. Peroxide is another alternative to commercial cleaners. It’s proven to be less harsh than bleach,and it’s a good option for cleaning shower doors. Peroxide is a natural antiseptic and stain remover. It will help dissolve mildew, dirt, and mold that may accumulate around the shower door frame. The ingredients in hydrogen peroxide can sanitize, “bleach,” deodorize and disinfect areas. Pour the peroxide in a spray bottle and apply to the shower door. Let it rest on the surface for about half hour. Use a cloth or sponge to work it in. Rinse the residue an wipe away excess water. As withany product, caution is the buzzword. Wear your gloves and avoid using full strength hydrogen peroxide. It may irritate the skin or lungs. Other recommendations include using white wine to clean away gunk from shower doors. Some studies suggest the anti-fungal properties in tea tree oil can help break up soap scum deposits. Since tea tree oil kills bacteria, it may help dispel bacteria in the soap scum. Borax is another age-old, affordable, multi-purpose product that can help keep shower doors clean. It helps break down dirt and grime and also deodorizes. Studies suggest mixing a solution of two cups warm water with two tablespoons of borax. Apply to the areas as needed. It will work through stubborn water stains and build-up, leaving your doors clean and bright. Mrs. Meyer’s brand of natural alternative household cleaners is another choice to consider. Studies suggest they contain organic compounds used in aromatherapy to help kep the home clean and fresh. The shower cleaner helps break down soap scum and mineral deposit stains on shower doors. Do not dilute. Spray onto the shower doors and wipe clean with a clean cloth. There’s a suggestion to use little lemon oil furnisher polish to help prevent steady build-up on shower doors. Numerous studies promote lemons as a natural cleaner. Some recommend that lemon oil acts as a barrier to minimize build-up. After you clean the shower doors, place a few drops of lemon furniture oil on a cloth. Work the oil around the doors and leave it on for a few minutes. Wipe it clean with a dry cloth. The slight film that remains will help repel soap scup. They are automotive products used to keep water off windshields. Studies suggest you try it on shower doors to help repel water stains. How did we miss this one? WD-40 is used to remove water stains and is another option for shower doors. It can help reduce the white soap scum film, clean and polish the glass doors to a new shine. It will also spruce up the metal lining around the doors. Follow the instructions for safe use. Open any windows and bathroom door before applying the product. Be careful to avoid inhaling the fumes while you work. Open the shower doors and spray the WD-40 onto each surface. Let it set in to help break down mineral deposits and soap scum. Wipe away residues with a clean cloth. You may apply a second coat as needed for heavy buildup. Let it sit for a more extended period and use a squeegee or magic eraser to work it in. Wipe the doors with a clean rag. WD-40 can be oily. Make sure you wash the entire shower floor down to avoid slipping. After you clean the shower doors, spray WD-40 on and wipe clean. It will help minimize streaking and keep the white film at bay. You can apply once a month to make scheduled cleaning less tedious. Glass Shower doors lend a sense of style and elegance to any modern bathroom. While many admire the look, it can be discouraging to watch hard water stains,and unsightly soap scum accumulate. If you’re thinking of remodelling your bathroom, you don’t have to worry about installing shower doors. Have a plan in place to schedule daily, weekly and monthly cleaning to help keep them clean and fresh-looking. Regular cleaning will help minimize excess build-up and reduce heavy cleaning which may leave scratching and streaking. A plan will also help reduce stress and allow you to enjoy your bathtime experience. And of course, you can show off your bathroom at any time!